Great wines are a passion for us at The String Bean and an essential element of our plan since launching our “Southern Bistro” more than seven years ago. Providing a diverse selection of high quality Belmont wine at moderate prices is something we take pride in and enjoy doing. We will continue to seek the best wines available and to expand the breadth of varietals and regions characterizing our wines. Our current Belmont wine bar includes more than 690 wines, ranging from esoteric blends from throughout the word to proven favorites from noted regions in the United States, Europe and Southern Hemisphere. This Belmont wine bar is different from others you might find. Instead of enjoying your delicious wine with small tapas, you can order a bottle to share over scrumptious southern comfort food. If you want to see all your options first, you can browse through our extensive offerings before sitting down to dinner, or you can purchase the full bottle of the glass of wine you had with lunch and just loved. 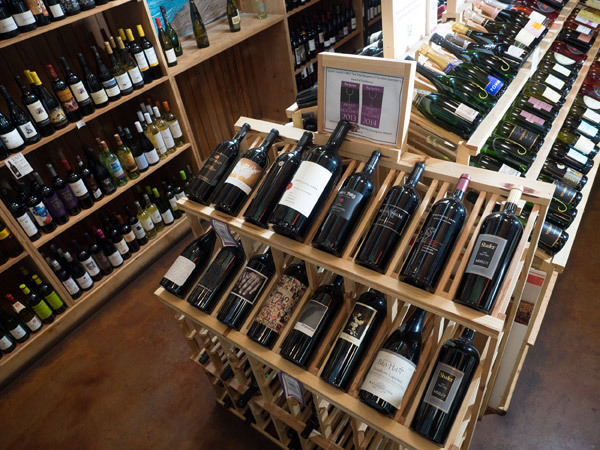 While you’re at it, ask one of our hostesses which wine will go best with a premium steak or fish from the best Belmont market around, the String Bean Market! If you’re heading to dinner with a friend or special somebody who isn’t interested in going to a Belmont wine bar, fret not! Our craft beer offerings are just as extensive! Each year we partner with several vineyards for exclusive wine dinners, tastings and a VIP Wine Spectator reception. A few of those vineyards include Patel, Silver Oak, Catena Zapata, Robert Foley, Donum Estates, Burly, Alexander Valley Vineyards and Whitehall Lane. We hope that you will join us for one of these evenings of good food, delectable Belmont wine and great company. Please allow us to make wines recommendations for your next special occasion or perhaps a gift. Low Tannins vs High Tannins: Tannins are a vital ingredient in wines, especially red wines. It comes from the stalks, skins and pips of grapes. Tannins in a young wine produce a bitter, puckering taste on the palate. Low Acid vs High Acid: Acids of various types are present in wine, and are essential to the wine’s longevity and also to your enjoyment. Too little can affect the wine’s quality and too much can spoil the wine. A higher acidity makes the wine more tart and sour tasting; whereas a low acidity results in flat tasting wine that is more susceptible to spoilage. Acidity is that quality that makes your mouth water and your lips pucker, and without it, wines (and anything for that matter!) taste pretty flat and one dimensional. However, when acidity is present in the right quantities, it is the element that makes all of the other flavours in the wine stand out, including the undertones of fruit, spice and herbs. The flavour in wine that you would describe as tangy, sharp, refreshing, bracing, bright, crisp or zingy is the acidity. No Oak vs Heavy Oak: Wines might be stored in oak barrels, usually to impart extra and more complex flavours. Oaky describes the aroma or taste quality imparted to a wine by the oak barrels in which it was aged. The terms toasty, vanilla, dill, cedary and smoky indicate the desirable qualities of oak; charred, burnt, green cedar, lumber and plywood describe its unpleasant side.